It's time to get busy around here. There was laundry that needed addressing. I got two more loads done today and even got three of yesterday's folded! One of today's was the sheets for our bed so at least I don't have to fold that! When I was putting the first load in I was reminded that I need to work on the mudding in the shower stall so that was my next job. I was feeling a little discouraged when I stopped for the retreat and quilt show but when I got going again I realized it wasn't quite as bad as I thought. I might be getting close to being done with the mudding and ready to start getting the painting and texturing done. I know, it really doesn't look that much better but I can tell. 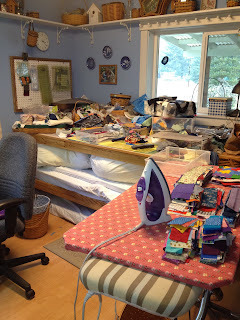 I got all the finished quilts moved out of the room or put away. I am working on my scrap drawers that were all left out after the paper piecing on the Harry Potter quilt. It is just time to get them more organized again. 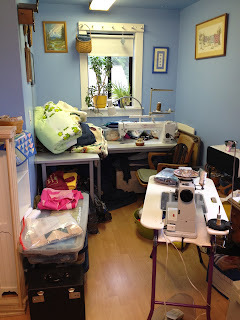 I plan to continue with the cleaning, sorting and organizing until I can use the whole top of the cutting table (or at least most of it). So fun to see your space Lucy! It's looking better after several hours over here --- it's just impossible not to make a creative mess when quilting -- I can't quit unless I let it go -- and then I shovel it all out again!